We "Parenthood" diehards consider ourselves extensions of the Braverman -- and Graham and even Rizzoli -- family. We've loved them, hated them, laughed with them and most definitely cried with them each and every week for the past six seasons, but that awful time has come to say our final goodbyes to the characters who have become just like our own nearest and dearest. "Parenthood" began as a straightforward family drama. There wasn't anything particularly exciting or edge-of-your-seat about it, but its simplicity is what made it so perfect. Inspired by the 1989 Steve Martin movie, Jason Katims gave it the small-screen treatment he is so wonderful at (ahem, "Friday Night Lights" and, currently, "About a Boy") and turned it into one of the best, most realistic and relatable, emotionally charged family dramas ever. Come on. Don't tell me you and your family don't speak over one another, cutting into each other's thoughts and sentences like a knife. We are either just like -- or know someone exactly like -- a Braverman, their significant other or one of the kids. And if we weren't or didn't, we wanted to be reliable like Adam (Peter Krause), as carefree as Crosby (Dax Shepard), talented like Sarah (Lauren Graham), as brilliant as Julia (Erika Christensen), supportive and stable as Kristina (Monica Potter), outspoken like Jasmine (Joy Bryant), rock-solid as Joel (Sam Jaeger) or as maddening as Hank (Ray Romano), adorable as Mark (Jason Ritter) or perfect like Dr. Carl (Josh Stamberg). We could relate to and see both sides of Amber's (Mae Whitman) willfulness, Drew's (Miles Heizer) sensitivity, Jabbar's (Tyree Brown) inquisitive ways, Sydney's (Savannah Paige Rae) spoiled brattiness, Victor's (Xolo Mariduena) skepticism, Max's (Max Burkholder) struggles or Haddie's (Sarah Ramos) independence. But most of all, particularly in this final season, maybe it's Zeek (Craig T. Nelson), the grumpy patriarch who is tired of being tired but doesn't want to fight anymore, who we see ourselves in. Or perhaps it's his wife, Camille (Bonnie Bedelia), the quiet force who keeps the family happy and at peace (except for that month or so where she up and left to go paint in Italy, but I quibble). And while the writing and direction of every episode has been stellar, it's the cast that we will miss so dearly. I can't imagine what my Thursdays (and Fridays, when I would re-watch the episodes) will be like without the Bravermans et al, and the pearls of wisdom that they might not even know they were doling out. I will forever be grateful for oldest Braverman son Adam's "everything's going to be OK" attitude (something all us "Parenthood" superfans are going to need right now) and Kristina's bravery and fight for what she believes is right. Their marriage went through the toughest and scariest of times, but never once did we think they couldn't survive it. They're the couple that inspired us, and made us truly believe that when the going gets tough, your better half isn't going anywhere. Joel and Julia always seemed to have it all -- and from far away they do. But for a while there, up close, it was a big old mess. Their daughter Sydney was barely tolerable, and son Victor was a tough nut to crack, but J & J never gave up. That is, until their marriage fell apart. After separating, it was almost a case of too little, too late, but both realized they loved each other. They still have a ton of crap to iron out but they still inspire us to fight, hard, for what we love while never giving up on our own dreams. Crosby and Jasmine's relationship started off rocky but after those initial ups and downs, they proved that they have each other's backs, no matter how opposite they are. She's controlling, he can be flighty yet their marriage has never wavered. Sure, they fight, they argue, they disagree -- but they showed us that that's not always a bad thing. In fact, it's how they deal with their issues that make them the two you would want in your corner any day. Sarah and Hank never seemed destined for the ending they're about to get. And whether you were on Team Mark (with Ritter showing up recently and Hank's family in the picture more and more, it did seem like it was going that way, didn't it?) or Team Carl, it's safe to say Team Hank was low on numbers. But Romano has been a revelation, through his relationships with both Sarah and Max. He and Sarah aren't exactly overflowing with passion but there's something about them that makes you root for them. I think it's safe to say we all want Sarah to get her happily ever after and in the last few episodes, Hank has made it clear that that's his priority too. Last week, we saw the connection Sarah has with her dad and in some ways, Hank is very much like Zeek, so if Hank's her lobster, we couldn't be happier. Then there's Zeek and Camille. Oh, dear. I thought she was trying to kill him as they hiked in the hills of San Francisco last week (who knows, maybe she wanted to give us enough time to recover before the finale?) but when he stopped to rest and told her wearily that he decided he doesn't want to go through another operation, wants to live his life and thinks it's what's best -- for them... well, I was a goner, a puddle on the floor. Despite their troubled times (his affair, her affair, ITALY), we know that the only thing that can tear them apart is death -- and as long as it's on their own terms, they're ready to face it together. Now that's love. We're now in the home stretch of "Parenthood"; will it be smooth sailing or will there be some surprise bumps? You never know what's going to happen, especially with Ryan (Matt Lauria) and Seth (John Corbett) showing up. Whatever happens, stock up your industrial-size box of three-plys, because not only is it wedding time (or is it? ), it's also the end of an era. However it's all going to play out, the one thing that's unavoidable is that it is the end. Let the tears flow freely one final time. 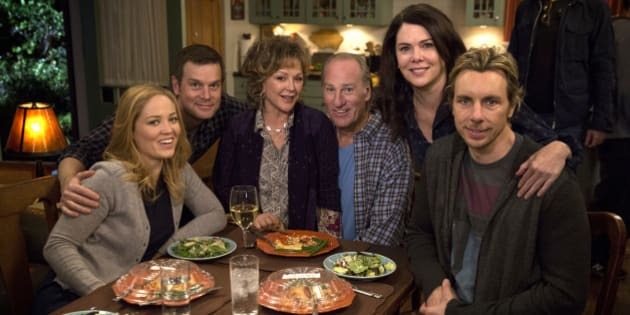 The final episode of "Parenthood" airs Thursday, Jan. 29 at 10 p.m. ET on NBC and Saturday, Jan. 31 at 10 p.m. ET on Global.